Nobel Peace Prize winners Nelson Mandela, Desmond Tutu and FW de Klerk have pledged their support for Table Mountain in the race to be named one of the New 7 Wonders of Nature. This flat-topped wonder has already been voted one of the final 28 sites for the New 7 Wonders of Nature campaign, a contest which aims to attract more than 1 billion votes across the globe. And with just over two months to garner support for Table Mountain, the Vote for Table Mountain supporting committee is proud to welcome South Africa’s most famous faces to the list of ambassadors calling on all South Africans to vote. At the opening of the Table Mountain National Park in 1998, Former president Nelson Mandela said: “During the many years of incarceration on Robben Island we often looked across Table Bay at the magnificent silhouette of Table Mountain. To us on Robben Island, Table Mountain was a beacon of hope. It represented the mainland to which we knew we would one day return. Table Mountain is the only contesting site in a country with three living Nobel Peace Prize winners who are supporting its cause. The Vote for Table Mountain campaign now has three iconic South Africans, who have played a significant role in the restoration and growth of our rainbow nation, promoting the success of our beautiful mountain. FW de Klerk, who received the Nobel Peace Prize in 1993 along with Nelson Mandela said: “Table Mountain is the defining visual icon of [link_cape_venues]Cape Town[/link_cape_venues] and [link_sa]South Africa[/link_sa]. It has been the backdrop to the unfolding of South African history. Its imposing stature makes one forget that Table Mountain has more plant species than all of the United Kingdom, hence its declared status as a World Heritage Site. Table Mountain is South Africa’s only candidate in the running to be named one of the Official New7Wonders of Nature, with voting closing on 11 November 2011. “I really can understand how, when God created all that there is he said, ‘I think I’ve got to do something special here’. And so God produced this fantastic gateway in the South – Table Mountain – our mountain, what a wonder! 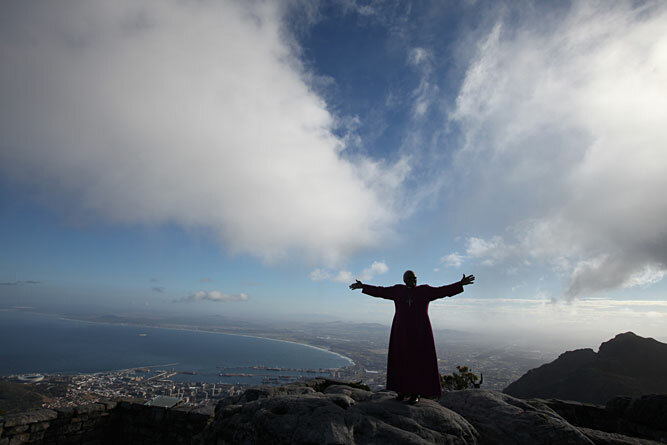 Help us take our rightful place among the New 7 Wonders of Nature,” says Arch Bishop Desmond Tutu. Vote via Mxit for only 20 cents.